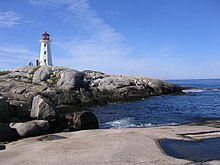 The Halifax Regional Municipality is the capital of the province of Nova Scotia, Canada. Halifax is a major economic centre in eastern Canada with a large concentration of government services and private sector companies. Major employers and economic generators include the Department of National Defence, various levels of government, and the Port of Halifax. Agriculture, fishing, mining, forestry and natural gas extraction are major resource industries found in the rural areas of HRM. Metropolitan Halifax is the urban part of the Halifax Regional Municipality (HRM). The HRM also covers a large rural area of Nova Scotia. Metropolitan Halifax encompasses the former City of Halifax. With its amalgamation into HRM, the City of Halifax was officially dissolved, however the provincial government designated the area occupied by the now-former city as the Halifax Metropolitan Area, often referred to as Metro Halifax, or Halifax. The dense urban core is centered on the Halifax Peninsula and sometimes also refers to the area of Dartmouth inside of the Circumferential Highway. Metropolitan Halifax is the most populous urban area in Atlantic Canada and home to Nova Scotia's capital district. The municipality is centred on the urban core and surrounded by areas of decreasing density the farther the community is from the core. Rural areas lie to the east, west and north of this urban core. Certain rural communities on the urban fringe function as suburban or exurban areas, with the majority of those residents working in the urban core. Farther away, rural communities in HRM function much as any resource-based area in Nova Scotia, being sparsely populated, with their local economies developing around four major resource industries. The Halifax Regional Municipality is an amalgamation of four municipal governments in the urban and rural areas, therefore its composition of neighbourhoods and communities is unlike other municipalities such as a city. 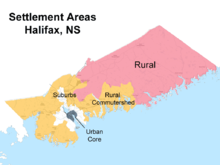 There are over 200o fficial rural and urban communities within Halifax County that have maintained their original geographic names (including the dissolved cities of Halifax and Dartmouth and the town of Bedford). The urban area of Halifax Regional Municipality is a major cultural centre within the Atlantic provinces. The municipality's urban core also benefits from a large population of post-secondary students who strongly influence the local cultural scene. HRM has a number of art galleries, theatres and museums, as well as most of the region's national-quality sports and entertainment facilities. The municipality is home to many performance venues, namely the Rebecca Cohn Auditorium, the Neptune Theatre, and The Music Room. HRM also is the home to many of the region's major cultural attractions, such as Halifax Pop Explosion, Symphony Nova Scotia, the Art Gallery of Nova Scotia, The Khyber, the Maritime Museum of the Atlantic and the Neptune Theatre. On special occasions, the city will put on a fireworks display which is best viewed from a boat. The region is noted for the strength of its music scene and nightlife, especially in the central urban core. See List of musical groups from Halifax, Nova Scotia for a partial list. HRM plays host to a wide variety of festivals that take place throughout the year, including: The Atlantic Film Festival, The Royal Nova Scotia International Tattoo, The Halifax Busker Festival, Greekfest, The Atlantic Jazz Festival, The Multicultural Festival, The largest Canada Day celebration east of Ottawa, Natal Day, periodic Tall Ship events, and Shakespeare by the Sea, to name a few. Many of these celebrations have become world renowned over the past several years. HRM has also become a significant film-production centre, with many American and Canadian filmmakers using the streetscapes, often to stand in for other cities that are more expensive to work in. The Canadian Broadcasting Corporation has its Atlantic Canada production centres (radio and television) based in Halifax, and quite a number of radio and television programs are made in the region for national broadcast. HRM is considered by many to be the cultural centre of the Maritimes. The municipality has been able to maintain many of its maritime and military traditions, while opening itself to a growing multicultural population. HRM's tourism industry showcases Nova Scotia's culture, scenery and coastline. HRM has many museums reflecting its ethnic heritage, including the Black Cultural Centre for Nova Scotia. Others museums tell the story of its working history, such as the Maritime Museum of the Atlantic. HRM is home to several internationally renowned events such as the Royal Nova Scotia International Tattoo, the Atlantic Film Festival and the Atlantic Fringe Festival. The HRM has numerous National Historic Sites, the most notable being Citadel Hill (Fort George) in Halifax. The iconic Peggys Cove is internationally recognized and receives 600,000 plus visitors a year. Cruise ships pay regular visits to the province. In 2010, Halifax received 261,000 passengers and Sydney 69,000. The urban area of Halifax Regional Municipality is a major economic centre in eastern Canada with a large concentration of government services and private sector companies. Halifax serves as the business, banking, government and cultural centre for the Maritime region. Major employers and economic generators include the Department of National Defence, as well as the as well as the Port of Halifax. 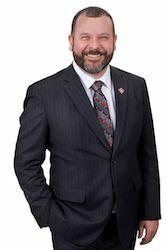 The municipality has a growing concentration of manufacturing industries and is becoming a major multi-modal transportation hub through growth at the port, the Halifax Stanfield International Airport, and improving rail and highway connections. A real estate boom in recent years has led to numerous new property developments, including the gentrification of some former working-class areas. Agriculture, fishing, mining, forestry and natural gas extraction are major resource industries found in the rural areas of HRM. Other resource industries in HRM include the natural gas fields off the coast of Sable Island, as well as clay, shale, gold, limestone, and gypsum extraction in rural areas of the mainland portion of the municipality. The Halifax Regional Municipality has a well-developed network of public and private schools, providing instruction from primary to grade twelve; one hundred and thirty seven public schools are administered by the Halifax Regional School Board, as well as four public schools administered by the Conseil Scolaire Acadien Provincial, whereas the fourteen private schools are operated independently. The municipality is also home to the following post-secondary educational institutions: Dalhousie University, Saint Mary's University, Mount Saint Vincent University, the Halifax campus of Université Sainte-Anne, University of King's College, Atlantic School of Theology, NSCAD University, Nova Scotia Community College, and the Centre for Arts and Technology. The presence of so many university and college students contributes to a vibrant youth culture in the region, as well as making it a major centre for university education in eastern Canada. Need More Information On Living In The Halifax Area?